What’s the difference between a sole proprietorship and an LLC? I am making goals for 2014 and working on my business is one of my goals. My hubby says I should do a LLC. Right now it’s a sole proprietorship. Can you help me understand the difference and tell me which is better? Thanks for your help. Limited Liability Company (LLC) status is granted by your state to limit your liability from a lawsuit to your business assets. LLC is a legal status. Sole proprietorship is a tax status from the IRS. Think of your sole proprietorship business as a single family house. It has one owner. Pretty simple. LLC status is like a fence around that house, protecting it. Set up a separate checking account for your business. IOW, do not mix personal and business monies. It’s like punching a hole in your fence! Avoid treating business assets as your own. Avoid personal guarantees on business loans. Finally, it goes without saying, but don’t commit fraud. Even LLC status can’t protect you if you’re a crook! 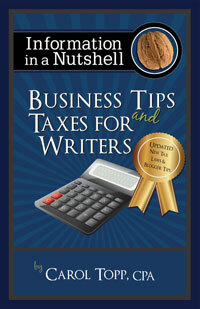 In my book Business Tips and Taxes for Writers, I devote a chapter to LLC status. You can read the chapter here http://taxesforwriters.com/book/. Also, in the 2014 edition of Writers Market is an article I wrote titled “Should My Writing Business be an LLC?” You can order a copy here.